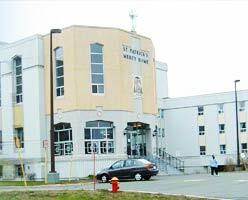 Through the inspiration and efforts of Archbishop Patrick Skinner, St. Patrick’s Mercy Home, a long-term care facility located in St. John’s, opened in 1958 under the administration of the Congregation of the Sisters of Mercy. Its mission is to provide quality and compassionate care for its residents. St. Patrick’s offers its residents a homelike décor, large rooms that are available to residents and family members for special gatherings; a patio garden is easily accessed while the auditorium provides space for concerts, parties and special large group gatherings. Many of the activities of the Home are supported by St. Patrick’s Mercy Home Auxiliary. The pastoral care department is welcoming to people of all faiths with many religious services being held in the large chapel. Medical, nursing, palliative, and respite care is available through its physician and nursing staff while social workers, physiotherapists, recreation and music therapists provide services that enhance the life of each resident in a particular way. In January 1986 a renovation and extension project for the Home was completed so that it could continue to provide a safe, comfortable and attractive atmosphere that speaks of its focus on residents. In September 1999, the Board of Directors of St. Patrick’s entered into an Agreement with the St. John’s Nursing Home Board in a process of regionalization along with other nursing homes in the area. In 2005, it became a member of the Eastern Health Authority. The year 2008 marks the 50th anniversary year of St. Patrick’s. Many and varied activities and celebrations involving staff, residents, church and government officials and the general public took place throughout the year. The chapel was rededicated to Archbishop P. J. Skinner in recognition of his untiring efforts toward the opening of a home for the aged and infirm; St. Patrick’s Mercy Home Foundation displayed a beautiful Donor Appreciation Window, acknowledging all who contribute to the care and well-being of the residents in any way. St. Patrick’s Mercy Home Foundation was established in 1998 to support all efforts of the home in ensuring continued high quality of care for the residents. It provides funding for improvements to environment and other needs that impact positively on the care and life of residents and staff.